The word scorpion is thought to have originated in Middle English between 1175 and 1225 AD from Old French scorpion, or from Italian scorpione, both derived from the Latin word scorpius, which is the romanization of the Greek word σκορπίος – skorpíos. Scorpions prefer areas where the temperatures range from 20 to 37 °C (68 to 99 °F), but may survive temperatures ranging from well below freezing to desert heat. Scorpions of the genus Scorpiops living in high Asian mountains, bothriurid scorpions from Patagonia and small Euscorpius scorpions from Central Europe can all survive winter temperatures of about −25 °C (−13 °F). 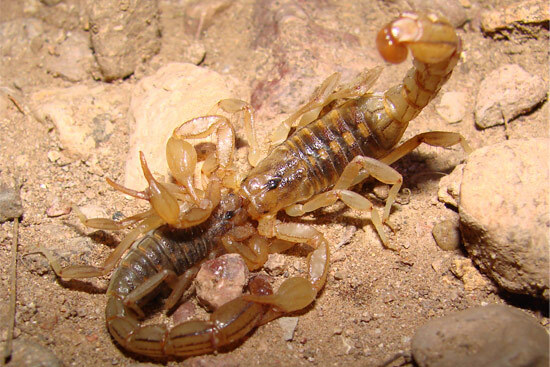 In Repetek (Turkmenistan), seven species of scorpion (of which Pectinibuthus birulai is endemic) live in temperatures varying from −31 to 50 °C (−24 to 122 °F). They are nocturnal and fossorial, finding shelter during the day in the relative cool of underground holes or undersides of rocks, and emerging at night to hunt and feed. Scorpions exhibit photophobic behavior, primarily to evade detection by predators such as birds, centipedes, lizards, mice, opossums, and rats. Scorpions are opportunistic predators of small arthropods, although the larger kinds have been known to kill small lizards and mice. Scorpions can consume huge amounts of food at one sitting. They have a very efficient food storage organ and a very low metabolic rate combined with a relatively inactive lifestyle. This enables scorpions to survive long periods when deprived of food; some are able to survive 6 to 12 months of starvation. Scorpions excrete very little; their waste consists mostly of insoluble nitrogenous compounds, such as xanthine, guanine and uric acid. When the male has identified a suitable location, he deposits the spermatophore and then guides the female over it. This allows the spermatophore to enter her genital opercula, which triggers release of the sperm, thus fertilizing the female. The mating process can take from 1 to 25+ hours and depends on the ability of the male to find a suitable place to deposit his spermatophore. If mating continues too long, the female may lose interest, ending the process. Once the mating is complete, the male and female will separate. The male will generally retreat quickly, most likely to avoid being cannibalised by the female, although sexual cannibalism is infrequent with scorpions. Unlike the majority of species in the class Arachnida, which are oviparous, scorpions seem to be universally ovoviviparous. The young are born one by one after hatching and expelling the embryonic membrane, if any, and the brood is carried about on its mother's back until the young have undergone at least one moult. Before the first moult, scorplings cannot survive naturally without the mother, since they depend on her for protection and to regulate their moisture levels. Especially in species that display more advanced sociability, the young/mother association can continue for an extended period of time. The size of the litter depends on the species and environmental factors, and can range from two to over a hundred scorplings. The average litter however, consists of around 8 scorplings. The young generally resemble their parents. Growth is accomplished by periodic shedding of the exoskeleton. 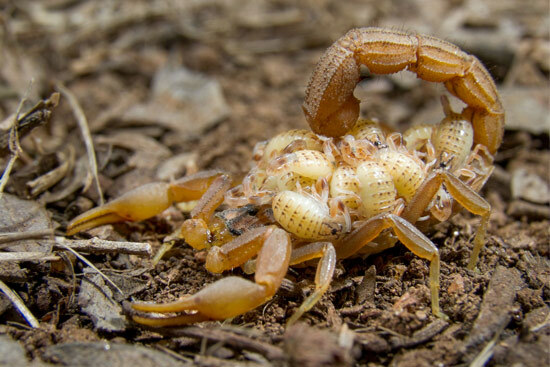 A scorpion's developmental progress is measured in instars (how many moults it has undergone). Scorpions typically require between five and seven moults to reach maturity. Moulting commences with a split in the old exoskeleton just below the edge of the carapace (at the front of the prosoma). 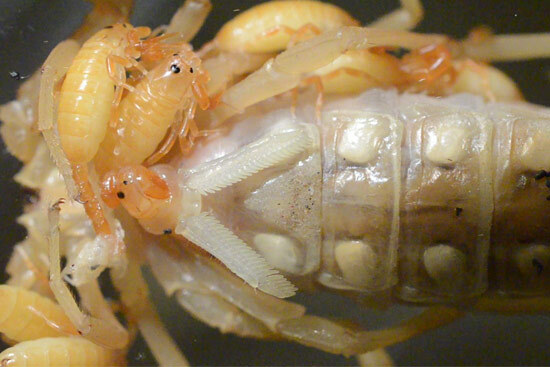 The scorpion then emerges from this split; the pedipalps and legs are first removed from the old exoskeleton, followed eventually by the metasoma. 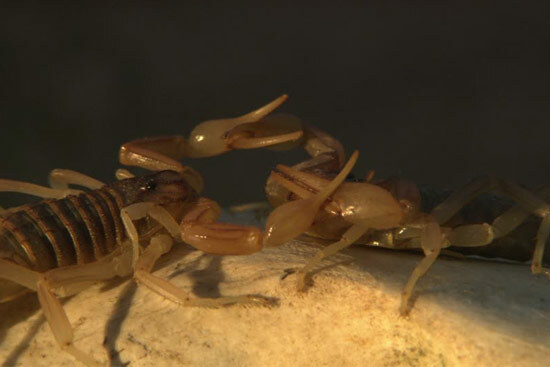 When it emerges, the scorpion's new exoskeleton is soft, making the scorpion highly vulnerable to attack. The scorpion must constantly stretch while the new exoskeleton hardens to ensure that it can move when the hardening is complete. The process of hardening is called sclerotisation. The new exoskeleton does not fluoresce; as sclerotisation occurs, the fluorescence gradually returns. First aid for scorpion stings is generally symptomatic. It includes strong analgesia, either systemic (opiates or paracetamol) or locally applied (such as a cold compress). Hypertensive crises are treated with anxiolytics and vasodilators. Scorpion envenomation with high morbidity and mortality is usually due to either excessive autonomic activity and cardiovascular toxic effects or neuromuscular toxic effects. Antivenom is the specific treatment for scorpion envenomation combined with supportive measures including vasodilators in patients with cardiovascular toxic effects and benzodiazepines when there is neuromuscular involvement. Although rare, severe hypersensitivity reactions including anaphylaxis to scorpion antivenin (SAV) are possible. Keeping your home and yard clean of debris is the first step towards scorpion control. Piles of firewood, boards, loose debris, rocks and other items create a habitat for the scorpion to live and hide. Scorpions are difficult to control with insecticides alone. Therefore, the first control strategy is to modify the area surrounding a house. Remove all trash, logs, boards, stones, bricks and other objects from around the home. Keep grass closely mowed near the home. Prune bushes and overhanging tree branches away from the house. Tree branches can provide a path to the roof for scorpions. Store garbage containers in a frame that allows them to rest above ground level. Never bring firewood inside the house unless it is placed directly on the fire. Install weather-stripping around loose fitting doors and windows (including the garage door). Plug weep holes in brick veneer homes with steel wool, pieces of nylon scouring pad or small squares of screen wire. Caulk around roof eaves, pipes and any other cracks into the home. Check shoes; shake out clothing and equipment left outside prior to use.